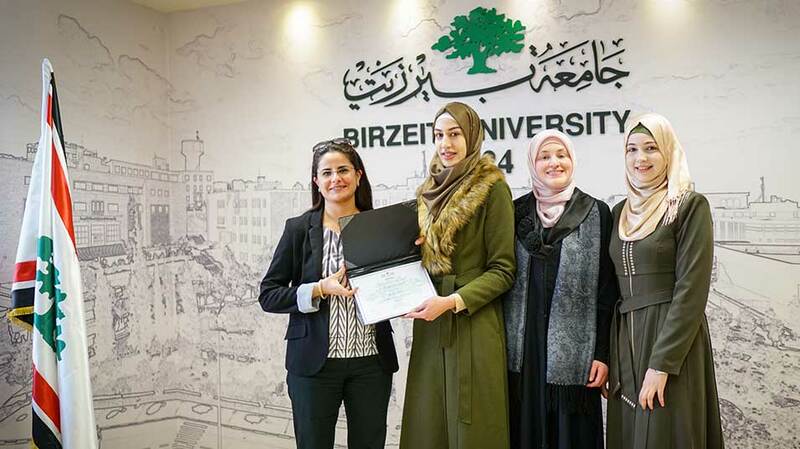 Alaa’ Badwan, Ayah Jarrar, and Safa Jabrini, three doctor of pharmacy majors at Birzeit University, claimed the second spot in the university’s entrepreneurial initiative for their application, Pharmacists Everywhere. The team, supervised by Director of the Samih Darwazah Institute Dr. Hani Ishtayeh, was awarded $25,000 to establish a startup to develop and release their application. “The application helps patients simply and easily get their proper medications and consult with the pharmacist-in-charge. It will also benefit pharmacies economically, as it would facilitate better access to patients with little costs,” Badwan added. The application is built on a subscription model, whereby patients enter the names of the required medications and the prescription, and then a pharmacy would respond and deliver the medicines to the patients. The application is mainly aimed at the elderly, said Badwan, who face difficulties in accessing pharmacies. The application will begin in Ramallah, at first, and then expand to cover other cities and areas. Jabrini said that the project is the first of its kind in Palestine. “While its’s still under development, with constant development and change, the application will begin operation during the current academic semester,” she added. Wrongful or misguided use of medications, added Dr. Ishtayeh, can leave patients with harmful side effects, especially children and the elderly. “Birzeit University, true to its mission and vision, encourages students to be active entrepreneurs and innovators in the society, and this entrepreneurial initiative will help them implement their ideas,” commented Dr. Ishtayeh.